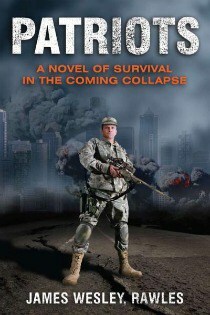 James Wesley Rawles’ (JWR) book, “Patriots” is a great story for anyone who is interested in survival. It’s a “How To” reference manual, written as an engaging narrative about a small group of everyday people who use teamwork to build a protected community in a post-economic collapse society. The book covers a number of important things to consider for anyone considering building or joining a group focused on survival. Some examples of topics covered in “Patriots” in regards to group survival are; complimentary survival training and skills, assignment of responsibilities, standardization of survival equipment and location and planning to get to the bug-out-location when SHTF. When I was working overseas on a security detail with a prior Force Recon Marine, he strongly recommended “Patriots“. He has been prepping for a number of years from his bug out location in a remote area of the great northwest. He gave more than just a strong recommendation though, he told me that it should be the first book I read, and the sooner, the better. I took his advice and when I returned to the U.S. (while still at the airport waiting for my plane to board) I pulled out my iPad, connected to the local WiFi and downloaded the book. The nice thing about having electronic copies of reading material is that you can carry an almost unlimited supply of reading material. The drawback is that… well, it’s electronic so it’s susceptible to not being available in a situation where you have no power to recharge your battery (portable solar panels can help in a grid down situation), or worse yet they can get fried in an EMP scenario (which may be mitigated if your electronic media is stored in a faraday container). In the meantime I do enjoy my electronic conveniences and although I try and prepare as much as possible for a SHTF scenario and somewhat for TEOTWAWKI, I am not someone who would be particularly happy to have to find myself in either of those situations outside of work. I thought the book was a great read. It’s sometimes difficult to get into a “how to” book regardless of the topic. Those types of books don’t lend themselves to being read cover to cover. I personally usually only flip to the sections I need at the time when reading that type of material. “Patriots” is a “how to” book that is written as a narrative. The positive aspects of this are that it makes it easy to read and I found myself getting through the story effortlessly since I was interested in finding out what happened next. In the meantime, as I read the story I was learning about a number of situations that could be encountered (and their solutions) in a long term SHTF/TEOTWAWKI environment. After this great introduction quote, the storyline kicks in as we begin to follow Todd Gray, an executive with a major corporation who is flown into Chicago for an emergency company meeting about the impending U.S. economic collapse. We get to follow Todd Gray as he witnesses the economic collapse of America. JWR let’s us know how Todd prepared for this through building his BOL (Bug Out Location), how he networked with others to create a self-sufficient group of people who would have complimentary skills and standardized equipment, how each of the individuals prepared for their roles within the group, and gave us examples of plausible ways that a crisis like this could unfold and how different situations could be dealt with. The book was interesting and engaging. Although there were a couple of situations that could be argued as “too good to be true”, or less likely to happen (“lucky” for the group), they were still plausible and within the realm of the possible even if remote. Remember that luck is not a planning tool and even if you don’t invite Murphy to your group, have not doubt that he will be there and his input trumps all. The best course of action is to plan first for what you would like to happen (the end result) and then backwards plan from there, taking into account at least two contingency plans for each phase of your plan. If your plan involves going somewhere to accomplish some type of goal, don’t forget to plan getting back home in the same manner. There are numerous examples of more likely scenarios that give great information and narrative about how the characters in the book are able to navigate through successfully. These are useful because when it comes to survival and prepping because there are an unlimited number of situations that you could worry about. It’s unrealistic to plan for every contingency (and expensive) however it is much more manageable to plan for the more likely situations. If prepping for the most likely situations first, you will find that you’ll be better equipped to deal with a wider range of scenarios than you may realize at the time. Some useful information covered in the book included: the benefits of weapon standardization within a group, advantages of SSB (single side band radio), the ease and maintenance of keeping older American made cars running during a long term SHTF, how having SME’s (subject matter experts) within a group who focus on one area and then training the rest of the group – makes everyone more effective, and how to manage finite supplies like water, food, fuel and other consumables for the long term within a group setting. The storyline is interesting and the information is useful. I would recommend the book “Patriots” to anyone interested in the prepping lifestyle. I think this book is great for folks just starting out since the narrative covers a wide spectrum of prepping scenarios, gear and planning in an easy to read, logical progression. I also think this book would be useful for folks who are further along with their exposure to survival skills and prepping too, since along with basics the book also covers more complex topics. Situations such as: group dynamics, long term planning, and plausible parallels to current developments in our society right now (economic crisis and it’s effects) are all covered in a well thought out and logical progression. 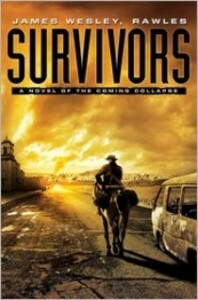 JWR has also released a new book called “Survivors” and the storyline looks like it would be even more interesting to me given that it follows a soldier who is stuck overseas when the SHTF back in the states and has to figure out how to get home to his family. I’m looking forward to checking that one out next!